Uploading Downloading Files To Internet PowerPoint Templates And PowerPoint Themes 0912-"Microsoft Powerpoint Templates and Background with laptop computer uploading or downloading files"-"Laptop computer uploading or downloading files business, computer, internet, global, technology" Give the right exposure to your ideas. 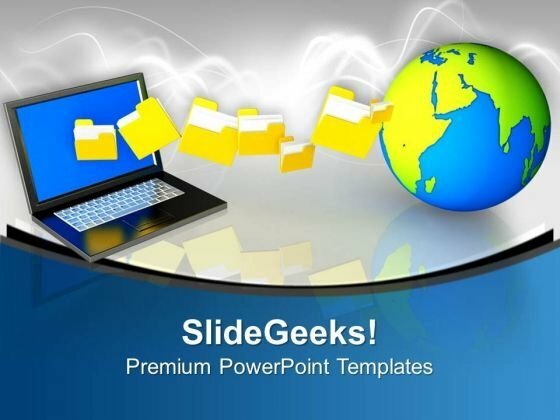 Our Uploading Downloading Files To Internet PowerPoint Templates And PowerPoint Themes 0912 will enhance their clarity. Dont make crammed slides. Utilize space appropriately with our Uploading Downloading Files To Internet PowerPoint Templates And PowerPoint Themes 0912. Dont pass up this opportunity to shine.